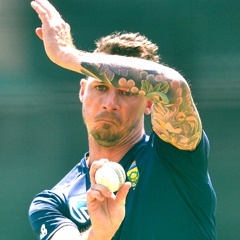 Cape Town - Proteas fast bowler Dale Steyn will ramp up his preparations for the important Tests later in South Africa's summer by going on a special conditioning programme in Cape Town. Steyn returned to the cricket field in the last week after a year on the sidelines with a shoulder injury and has played in three games for the Titans in the T20 Challenge. The paceman has bowled a total of 10 overs, taking four wickets and going for 61 runs over the three matches and has been satisfied with his comeback. He will now miss the Titans' next game in the tournament on Friday to do more fitness work as he aims to be ready for the four-day day/night Test against Zimbabwe in Port Elizabeth starting on Boxing Day. Steyn will also hope to be in peak condition early in the new year as the Proteas have two massive Test series against India and Australia. Asked if Steyn could be ready for the important Tests this summer, Proteas team manager, Mohammed Moosajee, told ESPNcricinfo: "If he plays enough in the T20 competition and bowls in the nets and maybe even plays a three-day provincial game, then I don't see why not." Moosajee said all the Proteas' frontline seamers who have been on the injury list recently, including Vernon Philander and Morne Morkel, will have their fitness and form monitored closely over the next few weeks. Philander has played in all three Cape Cobras games in the T20 Challenge while Morkel is said to be bowling at 80 percent as he continues his recovery from a side strain. "It's not only Dale that needs to bowl more, all the bowlers need to up their volumes ahead of the Test matches," continued Moosajee. "We have set plans for all the bowlers in terms of the numbers of balls and overs they need to bowl."